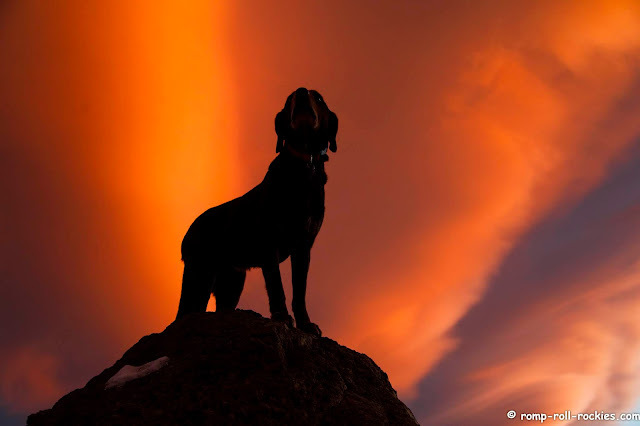 There is nothing quite as beautiful to me as my dog's silhouette against a beautiful sunset sky. Our natural world is majestic! R is feeling great. His body is still working on growing fur and healing from his eye removal. He will be back soon. I am still doing my photo journal of his recovery which I will share when he's looking almost fully healed. Stunning! Wouldn't it be wonderful to have a small bronze sculpture of this? That's an amazing photo. We're so happy to hear R is doing wo well. That photo is the true meaning of AWESOME!!! Yay for R and his home care team!! Absolutely incredible! More healing vibes are heading your way, R! That sunset...are there really words for it?? Stunning! Love your silhouette shots. Thinking of you and R! That truly is a stunning photo!!! Great to hear how well R is doing. Hope you all had a good weekend. It's a beautiful photo, and we continue to keep R in our prayers for continued healing. So glad to hear R is doing well. We always underestimate how our dogs will adapt, don't we? We should be more like them and just accept whatever Mother Nature inflicts upon us.